There are some really good courses in the south of France. Places like Terreblanche or Taulane will test even the best of players. Sometimes though such places can just be too punishing on a hot day and something a little more straightforward is called for. When you're looking for such an outing you could do worse than get along to Le Grande Bastide. Le Grande Bastide is in the Opio area - basically between Cannes and Grasse, accessible within 30 minutes from all the main conurbations in the area. It is a course which is definitely 'all in front of you'. No blind shots, only a little out of bounds, not much water. You may break into a sweat as a result of the climate but the course won't tax you too much. That's not to say you won't have fun here. I've probably played it half a dozen times and never had complaint about the quality of the conditioning. Most recently the mercury was up to almost 40 degrees and why the fairways were brown in some areas the greens were in very good condition and would have been worthy of a course of a much higher calibre. The course record around here is a 68 held by Victor Dubuisson when he was an amateur here which is scarcely credible. The course isn't a long one - 6,000 yards from the members tees, 6,700 from the medals - and it is pretty hard to get into too much trouble. There are some trees around but if you are off line from the tee you will normally be just fine. There are a couple of holes which may leave you scratching your head, the tee shot at the par 4 15th requires a well placed mid iron to a tight landing area before a longer club to the green for example, but all in all it has far more going for it than against it. I am rating it as a 14 because it really doesn't compare to many of the courses on this site - it is nowhere near the top 100 in France I imagine - but don't let that out you off. Sure it's never going to be the centrepiece of a golf trip to the area, but there are plenty of other courses in the area that will take up that mantle. For a nice 'other' course on a tour, or for a gentle game when in the area it has much going for it. You can book tee times online here. The course is part of the 'Open Golf Club' group (no association with the R&A!) which co-ordinates booking and offers. Green fees vary from €43 in the off-season to over €80 in the summer. It tends to be busy first thing in the morning in the hot months before the sun gets too hot. You can hire clubs here for around €35. However, expect some of the worst hire clubs you will ever come across! 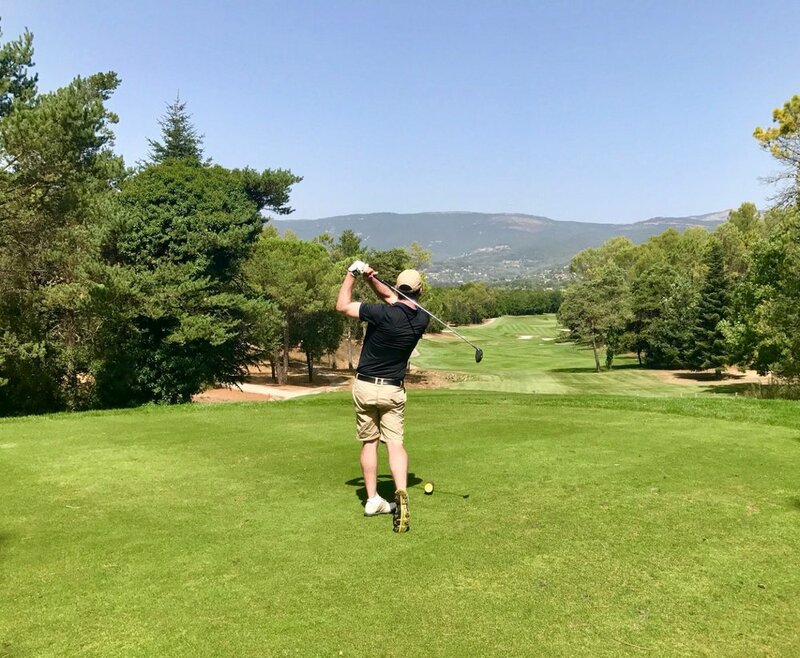 The South of France is a great venue for a long weekend golf. Cannes is probably the best place to stay. By day you can get to most of the best courses in the area fairly easily. The pick of the bunch are probably Cannes Mougins, Terre Blanche (45 minutes) and Taulane (1 hour 30). Notable 'second tier' courses in the area would include Saint Donat (20 minutes) and Grasse (25 minutes). If you're travelling from the UK then fly into Nice airport (half an hour from Cannes) - there are plenty of options from many regional airports in the UK and across Europe. If you are staying in Cannes then stay central so you can walk to the beachfront hotels or old town bars easily. We have done both hotels and Airbnb and there are plenty of options. You could probably play here all year round but it's probably at it's best from April to October. The French may have a reputation for stuffiness but actually after dozens of rounds here I can say I have never had anything but a warm welcome. Even the starter at Cannes Mougins who asked us to tuck in our shirts did it in a very nice way!